An artist's depiction of a so-called "hot Jupiter"-type planet orbiting a star of about the same size as our sun. NASA's new mission to the sun may reveal clues about alien worlds, too. Every day, we rely on the sun for warmth and light, but we need Earth's atmosphere to protect us from our star's harsh conditions — and because in the end our sun is just another star, the same could be true of life on other worlds, planetary scientists told Space.com. "We can learn so much from our sun and particularly for other sun-like stars," Evgenya Shkolnik, an astrophysicist and planetary scientist at Arizona State University, told Space.com. In particular, she wants a better sense of the high-energy particles and photons, or particles of light, stars produce. "It's critically important to understand all these things for exoplanet hosts, for sure," she said. We know about the dangers of those particles and photons from our own experiences here on Earth, where the planet's atmosphere buffers us from the worst side effects of living near the sun: Only with extreme sunbathing do we absorb enough ultraviolet radiation to damage the DNA inside our cells enough to potentially kill us with cancer, and only during the most extreme solar outbursts, called coronal mass ejections, do its highly charged particles overwhelm Earth's magnetic field and thus interfere with our technology. If an exoplanet is less fortunate in its natural protections or in its star's temperament, those high-energy particles and photons could be the deciding factors in an exoplanet's habitability, said Ravi Kopparapu, a planetary scientist at NASA. Even if a planet develops an atmosphere, if it's bombarded by too many stellar particles, that barrage can destroy the atmosphere. "They can strip away the atmosphere and then make the planet uninhabitable," Kopparapu told Space.com. But both types of high-energy outflow are incredibly difficult to study at a distance — hence the appeal of piggybacking on the Parker Solar Probe. The spacecraft's path through the sun's broiling outer atmosphere will allow it to get within 4 million miles (6 million kilometers) from what we consider the sun's surface — about the same distance many exoplanets are from their stars, Shkolnik said. In fact, in her lectures about these planets, she edits images of the solar eclipse and planet depictions to convey the incredible environment around these planets. "I show the corona and put fake exoplanets in there because it is amazing to think that these planets are actually streaming through their suns' coronae," Shkolnik said. 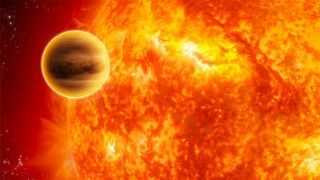 Many of those planets are what scientists have dubbed "hot Jupiters" and are uninhabitably gaseous themselves — but that might not be the end of the story. "There is talk of whether or not moons around these hot Jupiters [orbiting small, faint stars] could be habitable," Shkolnik said. (Scientists haven't discovered any such moons yet, but they're still honing their ability to spot planets, which are much larger.) "That's not a crazy thought, because we think that the moons of Jupiter and Saturn might be places to look for life in our solar system," Shkolnik said. And high-energy radiation like ultraviolet light doesn't just potentially destroy ill-shielded life; it can also trick scientists into thinking someplace is more lively than it really is. That's because ultraviolet radiation can break down water and create oxygen, one of the key molecules scientists look for as a potential signature of life. Extrapolating data from the Parker Solar Probe may stop scientists from being fooled by these fake biosignatures, Kopparapu said. Perhaps most valuable will be any understanding the spacecraft can give us of how the sun's dynamics are shaped by its magnetic field, which seems to guide much of what happens in and around a star. "Somehow, it's all related to the sun's magnetic field," Shkolnik said. "Even if we don't have the details, we know that much."